Six myths about SR-22 Insurance – So you have probably had a number of violations, probably had your driving license suspended and been asked by the Department of Motor Vehicles to produce an SR-22 to get your suspension lifted. While trying to understand this new requirement, you probably have heard a couple of things that are getting you confused about how SR-22 will be of service to you. Let us unclog your mind by dispelling the myths around SR-22 and shine a light in that area. Generally speaking, an SR-22 is a document that you will need to produce at the department of Motor Vehicles in your state in order to prove that you are financially responsible for any accidents you may be involved in after you have been involved in a traffic violation and can only be given to you by your auto insurer. Let us delve into the myths that surround SR-22 and probably discourage people from getting it. An SR-22 expense is a one-time nominal fee and unlike what most people may think it is quite cheap. The expense that you need to look out for is your insurance premiums. Your need for a SR-22 is proof that you are a risky driver and the obvious thing is your car insurance premiums will increase. This myth is therefore based on fallacy. That is not true at all. An SR-22 in not an insurance cover, it is a document to prove you are who you claim you are and have an insurance cover with an insurance co. Do not be deceived into believing that by owning the document you are safe. Renew your insurance on time because if you violate this requirement, you may have to keep the SR-22 for a longer time than you had anticipated. SR-22 is not insurance. The law does not permit any individual to have different insurances on their motor vehicle from different insurance covers. 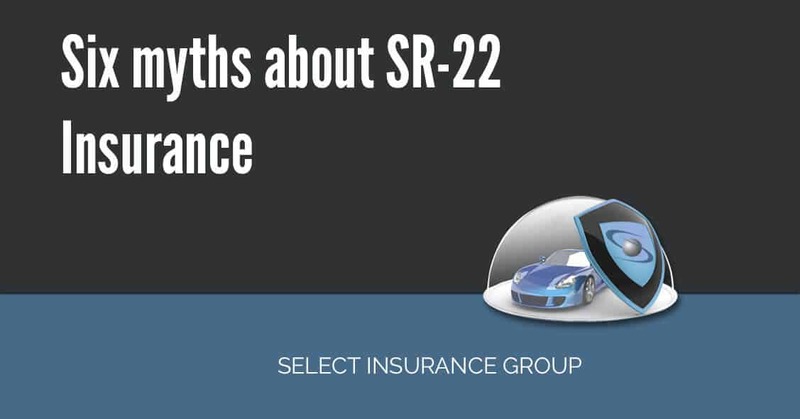 While an SR-22 is not insurance, it is still forbidden by law to attempt to get a SR-22 from a different company than the one that has issued your motor vehicle insurance. As a matter of fact, unless you encounter a con, you will be dully advised that it cannot happen and the only company that can I issue you with a SR-22 is the company that already covers you. The law simply won’t permit it. If you are a holder of this document, then this automatic makes you a high risk driver no matter what state you are in. So do not buy into the belief that once you move states you can drive around without your SR-22. That may be a problem building up for you. The law is uniform across states on this one. You must carry your SR-22 at all times, until a time when you are notified that the required time is up. If you have had a suspension lifted because your insurance company issued you with a SR-22, do not abuse that privilege. For one reason, it is not a preventative document. It is curative. It will not protect you from having more privileges taken away the moment you go on and violate another traffic rule. As a matter of fact, break another traffic law and your requirement to carry the SR-22 will be increased. This myth is founded on a lie. So be careful not to get another suspension. Clearly this one too is not true. The Department of Motor Vehicle or court will penalize you through other means when there is need to-for instance through fines. However, when they ask for a SR-22 they simply want an assurance that should you get into an accident you will be financially prepared and able to meet the costs. If you are a high risk driver- for instance you drive while drunk, you tend to over -speed and are generally in the habit of violating traffic laws, a SR-22 is what you need. Remember to separate myth from fact by getting the correct information from your insurance provider. Newer What is the process of getting a SR-22?